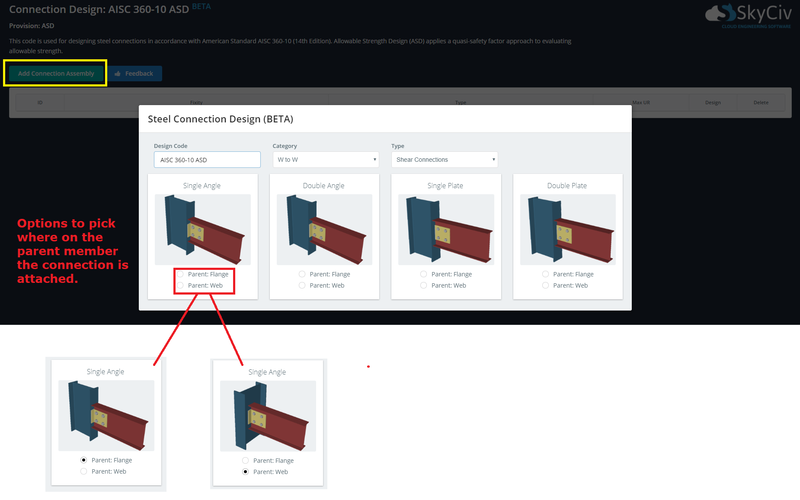 To get started with adding a connection to be designed, let take a look at how to first enter the connection design module. 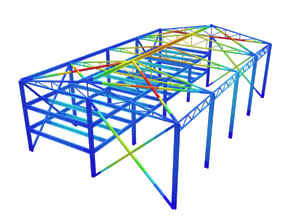 The integrated version of connection design works directly with Structural 3D (S3D). This workflow complements engineers (or close teams) who design both the members as well as the connections in the one workflow with SkyCiv. From the Model area, transition to Design by clicking the Design button at the top right. Your structure will solve if it hasn’t already been solved. 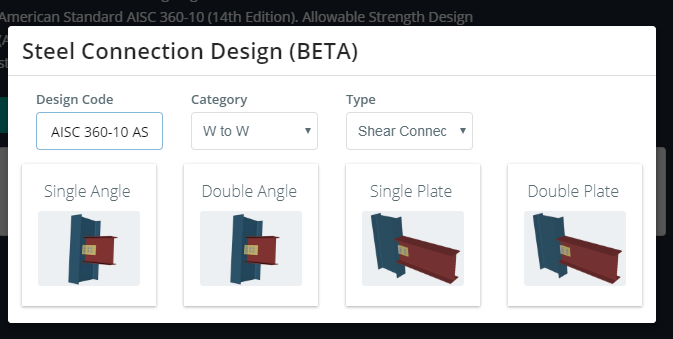 Select Connection Design from the design options. Choose your design module and click ‘Start’. Click the ‘Add Connection Assembly’ button to add a connection. From the pop up, select a connection to add (click a tile). Change the ‘Category’ dropdown and ‘Type’ dropdown to view the various options. A new row will be created with your connection of choice in the table. Proceed to fill in the ‘Parent’ field (this is the supporting member) and the ‘Children’ field (these are the supported members). Certain connections are able to support more than 1 child member, and you can fill these in with comma separated numbers e.g. 11,12. If a valid selection was made, the ‘Fixity’ field will populate with the fixities at the connection location, the ‘Node’ field will populate with the node ID location, and a line representation of the connection will be drawn on the wireframe. To design the connection, click the icon under ‘Design’, and to delete the connection click the icon under ‘Delete’. In the next section we will look at how to edit your connection. The standalone version of connection design can be run without having to build a structural model first. This would be useful if the design of the connection and the design of the members are being carried out by different groups in collaboration with one another, but independently. To get started, expand the left menu, and click the ‘desing’ button. 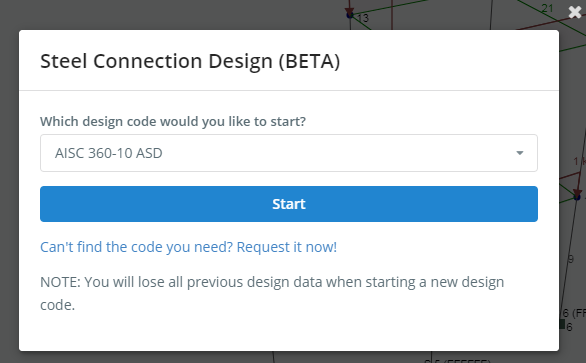 In the design menu, click the ‘Connection Design’ module. 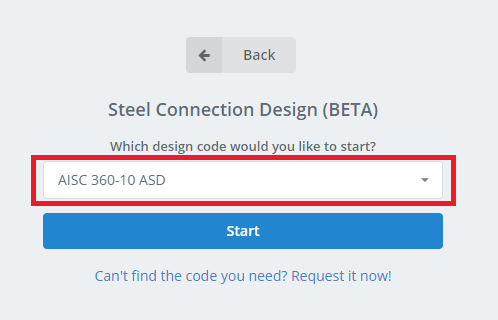 Select the design code applicable for your connection design from the dropdown, and click ‘Start’. Add a connection by clicking the ‘Add Connection Assembly’ button to bring up a popup of options. Notice that there are some differences in this popup compared to the one that exists in integrated. Most notably, there are now radio options to select where on the parent member the connection is attached. This is an important option to make available, since previously, in the integrated version of connection design, this orientation was determined by the structural model.